Finally, an entry level gourd rack with state-of-the-art features, that is made with quality materials, is gentle on the budget, and is easy to assemble! 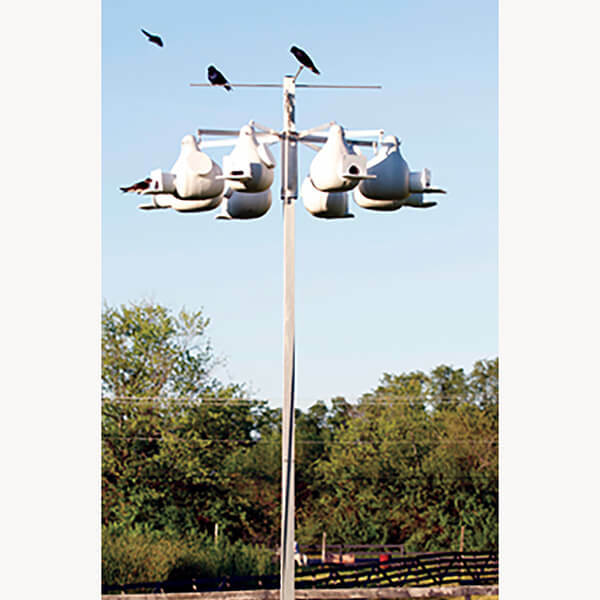 This rack features a 2-inch-square, high-tensile strength aluminum, two-piece pole that is 14 feet tall above the ground when installed. The gourd hub and arms hold 8 gourds and raise or lower with a 2-pulley, nylon rope lanyard system. This rack is available in one model with gourd-mounting arms for any gourd with front-to-back hanging holes (such as all Troyer Gourds, some S&K Gourds, natural gourds, and any SuperGourd). SuperGourds now come with drill-guide dimples for front-to-back drilling. Older SuperGourds are easily drilled front to back with a 13/32” drill bit. The gourd hub and arms accommodate 8 gourds and raise and lower with a 4-part rope & pulley lanyard system. Pre-installed nylon glide buttons in the hub assure squeak-free operation. The aluminum horizontal gourd mounting arms attach to the hub using stainless steel hardware. Includes pole, ground stake, top perch rods, hub, arms, rope and pulley, rope winder, pole cap, and hardware. Easy assembly. An optional pole guard (PGS or EZ2) that fits a square pole is available. The height of the installed system is 14 feet above the ground. Includes two 48-inch top perches, an aluminum heavy duty aluminum ground stake, and all the hardware necessary for assembly. I have 4 of these Racks, i like the way the aluminum arm brackets are put together for the GMA to attach to.. A Great Rack for up-to 8 Martin pairs to call Home for the Summer..